Have you checked out the label freebies over at World Label lately? They're continually adding to their collection of printables. The files have editable text fields and fit a variety of standard label-paper sizes. 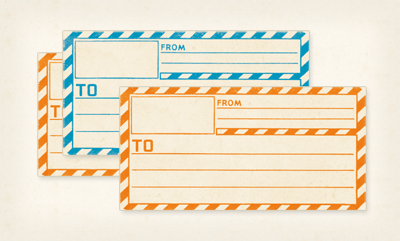 I like these vintage mailing labels provided by The Graphics Fairy. They come in six colors (though orange is superior, of course). Find more designs by scrolling through the World Label blog. These labels do have the vintage look, very cool. My favorite color is also orange. So sweet... I will definitely use them. Thanks. Thanks for this, they are lovely! Oh man, I'm in label heaven! This is the perfect combination of vintage and paper goods. Gorgeous! Very Cool... Vintage never goes old! Oh wow I'm in love! Thanks for sharing! Cute! Thanks for posting this link - those editable faux chalkboard labels are too cool too! This is indeed perfect for the card I'm working now! Thanks so much for sharing this free download! I love vintage designs!